Appointed to his current academic position in 2001, Professor Xun Sun is serving as Director of Orchestral Activities at Southern Utah University. As a tenured Associate Professor of Music, his teaching duties include that of conducting the University Symphony Orchestra and String Ensemble. In addition, he teaches courses in Advanced Instrumental Conducting and Applied Instruction of Violin in the Music Department. Professor Sun has continually broadened his professional career as an orchestral conductor. His most recent performance was conducting the world premiere of the dance drama "Helen's Dream" with Hubei Opera and Dance Drama Theatre of China. He conducted the world renowned China Philharmonic Orchestra in recording a new CD of the Spanish Trail Suite, music by American composers Marshall McDonald and Steve Nelson. In 2007, he was invited to conduct the Lviv Philharmonic in the 8th International Contemporary Music Festival in Ukraine. Mr. Sun successfully conducted Carlisle Floyd's opera Susanna, the opera of Hansel and Gretel by Humperdinck and Mozart's opera The Magic Flute. Professor Sun will continue to teach the master-class in conducting in Hunan, China. 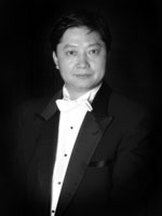 Professor Xun Sun has served as the Music Director/Conductor of the Orchestra of Southern Utah since 2003. Under his direction, the OSU world premiered the symphonic suite Spanish Trail Suite by Marshall McDonald and Steve Nelson. In June 2008, the League of American Orchestras presented OSU with an Award of Excellence in the Annual Gold Book Online competition and an Audrey Baird Audience Development Award, making OSU the only orchestra to receive these awards from the League of American Orchestras this year. Mr. Sun has made many appearances over the years in concert series and educational programs. In 2005, the League of American Symphony Orchestras honored OSU with one of the three national awards given for educational service. Born in the city of Taiyuan, China, Mr. Xun Sun manifested distinctive musical talent at an early age. He began his formal music training and violin studies at Wuhan Conservatory of Music at age 11 through the government's scholarship program for exceptional music students. This substantial music training led him to successful graduate studies in United States. While holding the Evelyn Ryan Nelson Concertmaster Fellowship at the University of Missouri-Kansas City (UMKC) Conservatory of Music, he concurrently served as assistant conductor in the Conservatory Symphony Orchestra. He holds master's degrees in Instrumental Conducting and Violin Performance from the conservatory of UMKC. Sun is also currently a doctoral student at Teacher's College, Columbia University, New York.